This card started with a test piece using the Pattern Party masks and Embossing Paste, to which I had added a drop of Fresh Fig ink and lots of Dazzling Diamonds glitter. Having sat on my table for quite some time while I remained perplexed what to do with this shimmery pink wall pattern, I added some flowers, foliage and ribbon. The flowers, from Beautiful Bouquet, are patted into a lighter ink and then sponged lightly with a darker ink before stamping. They are cut with the matching dies in the Bouquet Bunch framelit set. For the foliage, I cut several of the bunches in Tranquil Tide and Emerald Envy cardstock and cut some of them into smaller pieces as I arranged them because I wanted it to look more like a garden than a bouquet. I saved 10% by purchasing the Beautiful Bouquet stamp set and Bouquet Bunch framelits as a bundle. 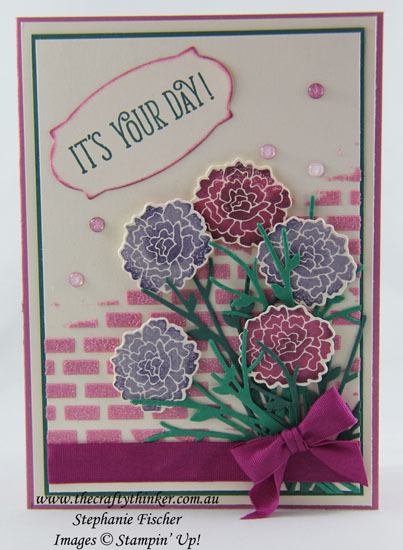 The greeting, stamped with Tranquil Tide ink, is from the Happy Birthday Gorgeous stamp set. 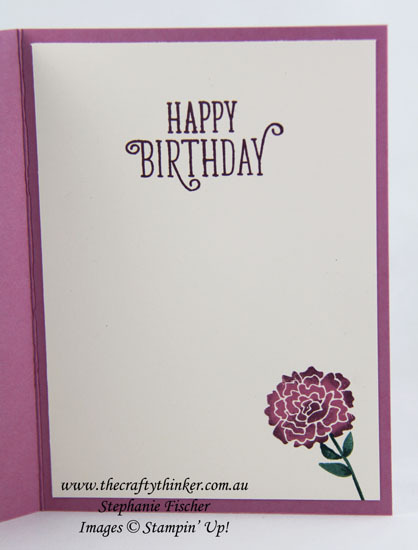 I cut it out with the label from the Rose Garden stamp set and edged it with Sweet Sugarplum ink. The finishing touches were the Glitter Enamel Dots.